Vortices. We hear about them all the time in modern F1 design and it goes without saying that there has been a lot of development in producing and utilising vortices for aerodynamic performance over the past decade. This piece aims to cover what they are, how they are formed and why they can be both advantageous and detrimental. Vortices, the plural of ‘vortex’, can form in two ways however let’s underline just what type of vortices we are looking at for this piece. A regular vortex is a region of air spinning around an imaginary axis and can easily be formed by simply stirring your tea with a spoon or pulling the plug from a sink filled with liquid and watching it drain. What we are looking into here are wingtip vortices – vortices induced by the natural properties of air as it flows over a surface. They can be seen as spirals of air trailing behind the tips of a wing, be it on an airplane on a racing car. Due to their rotation they are often the biggest cause of induced drag as they are turbulent and slower than clean, laminar airflow. Let’s take a standard aerofoil as an example. Negative sign (red) indicates low pressure; positive sign (green) indicates high pressure. 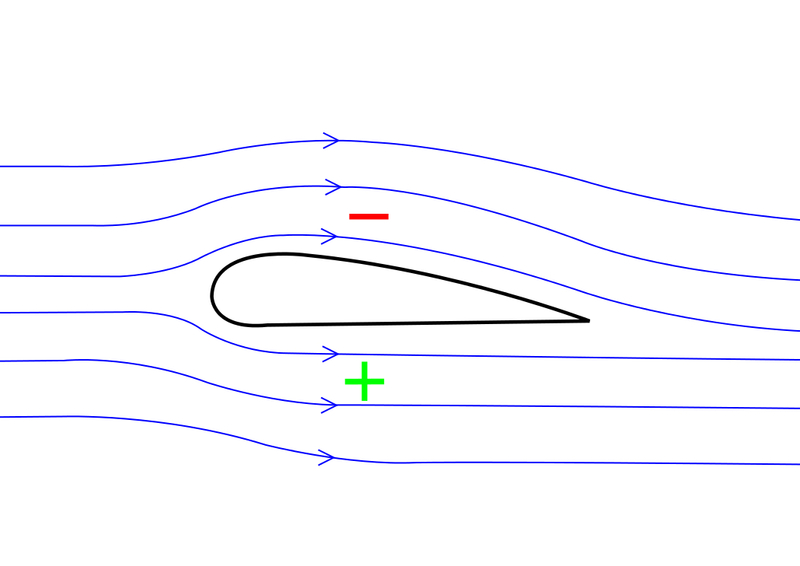 Air is divided as it passes over the aerofoil, creating two pressure regions above and below the plane: faster air moving over the plane creates a low pressure region; slower air beneath the plane creates high pressure. This induces lift on the aerofoil, which is how a plane flies. Easy. To produce downforce (like a racing car does), the aerofoil is flipped over for the reverse effect. Air always wants to move from regions of high pressure to areas of low pressure because it wants to counteract any displacement, which in this example is being caused by the aerofoil. A fluid can be compressed but it has to go somewhere – it cannot disappear. Air cannot travel through the aerofoil itself as it is a solid object, so it will instead try to migrate at the tips of the aerofoil. As a result, high pressure air that passes around the outer extremities of the aerofoil beneath the plane tends to get sucked into the low pressure region above. 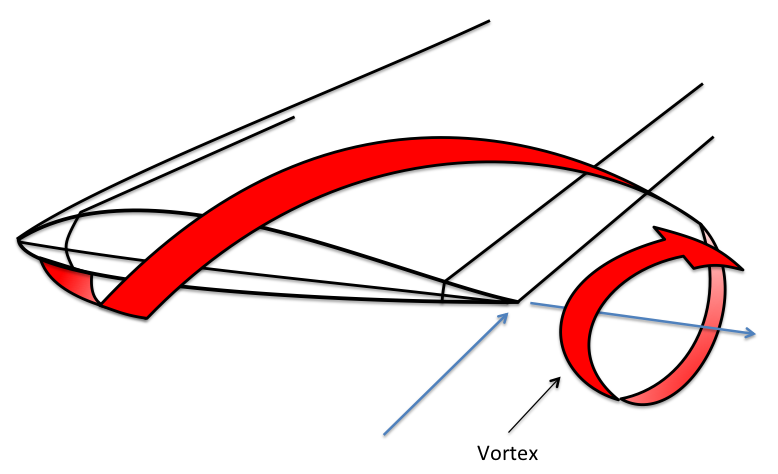 The speed at which this process occurs causes a rotating mass of air extending from the trailing edge of the aerofoil, forming an elongated vortex. Because there is a constant driving force from oncoming airflow, the vortices continue to build as speed increases. As speed decreases, the vortices deplete until none are formed at all as the driving force is too low. When and why are vortices formed in F1? Due to the high pressure and low pressure areas that form above and below the car respectively, vortices are an inevitable product of when these two air masses converge. Because they create drag, vortices tend to be a pain in an aerodynamicist’s side which is why teams have developed ways of reducing their impact to increase top speed. Take the rear wing endplates as an example. Endplates are placed on the tips of the wings to prevent the high pressure air above the wing (remember, we have now flipped the aerofoil over to create downforce rather than lift) spiralling its way to the low pressure below. However this cannot be totally managed as vortices still form at the very tips of the wing where the two pressures converge, causing drag and lowering top speed. 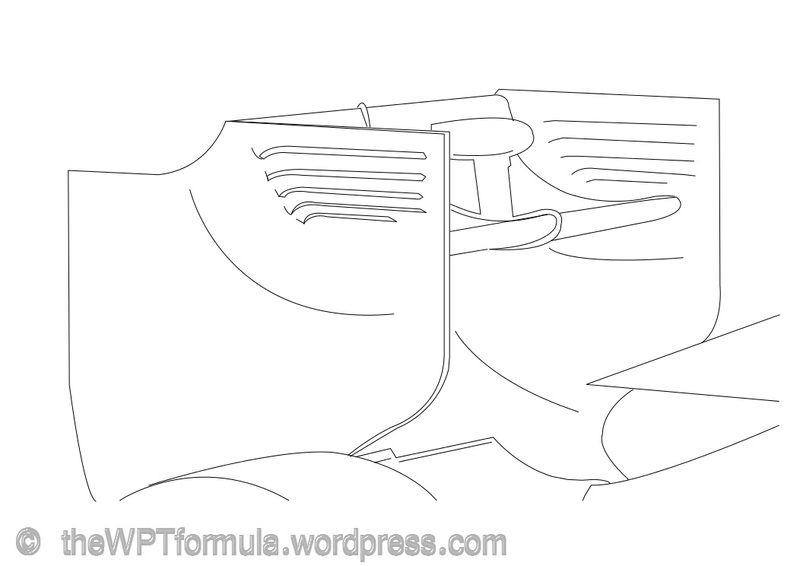 To suppress this occurrence, the teams install endplate louvres (or slots) in the endplate. As explained in my analysis of rear wing endplates, these louvres draw high pressure air from above the wing out to the slightly lower ambient pressure outside of the endplate. This reduces the pressure gradient formed between the top and bottom surfaces of the wing as it reaches the wing tips and thus reduces the vortices that form. Although vortices create drag, there are some instances when generating them becomes an advantage for overall performance rather than straightline speed. A more recent example of this is the Y250 vortex that is formed at the front wing before travelling along the side of the car. 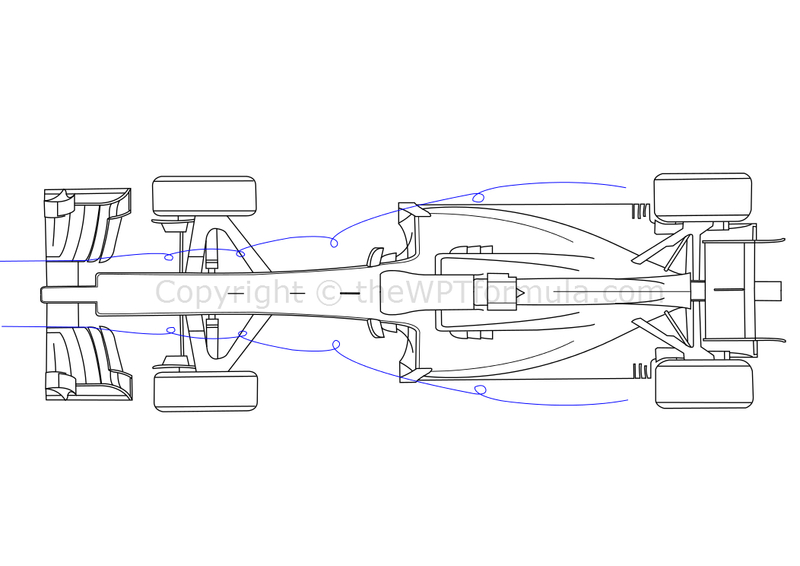 Called Y250 because it is formed 250mm from the car’s centreline, this is the area where teams can start to develop the front wing with relative freedom compared to the 500mm neutral section in the middle of the wing. The elements will be stacked and shaped in such a manner that the high pressure air flowing above the wing will be encouraged to form with the low pressure passing beneath, creating an elongated vortex that dissipates towards the rear of the car. Its primary function is to act as a barrier between the edge of the floor and the front tyre that lies in close proximity. The tyre creates a lot of turbulence as it rotates, projecting disrupted airflow towards sensitive areas of the car, such as the leading edge of the floor, as it travels. This turbulence reduces the efficiency of the underfloor of the car which therefore results in a loss of downforce. The vortex produced by the front wing does a substantial amount of work in keeping this turbulence away from the floor, as well as the leading edge of the sidepod. As the vortex spirals along the car, it is deflected by the sidepod airflow conditioner to move alongside the floor before it loses its energy towards the rear tyre. This allows teams to run the cars at a high rake angle as the high velocity airflow passing beneath the car cannot escape due to the vortex’s presence. Here’s a more visual demonstration of this effect, when we saw the Y250 vortex from Mark Webber’s nose camera during damp conditions in Brazil. Other examples of deliberately inducing vortices include Vortex Generators (VGs), which I also took a look at in this piece here. They work slightly differently in some circumstances (such as the VGs on top of the sidepods) but they can often be seen in a more conventional manner on the front wing, where the teams place curved vanes that point outwards around the front tyre. The curvature of the vane produces a small pressure gradient between the two sides, causing air to loop over the top which forms a vortex. Edit (27/04/2014): A more recent example of vortex formation at the Chinese GP. Video by Matt Somerfield (@SomersF1). Hopefully you found this post useful as I know a lot of you were asking for something like this. If I have missed something or need further clarification on the subject, please leave a comment and I’ll get back to you! This entry was posted in Analysis, General and tagged explained, f1, formation, induced, vortex, vortices, wingtip, y250 on April 26, 2014 by thewptformula. Thank you, and maybe! There are different types of vortices so I may explain how each type is used.